Simpson Aerospace Services and Simpson Alloy Services have been family owned and operated businesses since 1992. 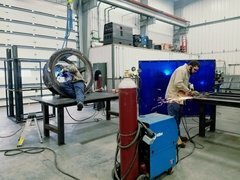 (PRLEAP.COM) March 23, 2019 - With the launch of their new website, SAS-INC., an aerospace maintenance and heat treatment manufacturer out of Elizabeth, Indiana is reaching clients across the U.S. and internationally. 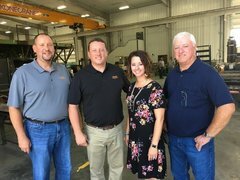 Both Simpson Alloy Services, Inc. and Simpson Aerospace Services make up SAS-INC.
A family-owned and operated business, SAS-INC. originally began as a sister company to a successful farming operation. The company first diversified into providing high temperature alloy metal services through the inception of Simpson Alloy Services. As the business and family grew, expertise and knowledge were added which allowed the brand to leverage itself across several new industries resulting in Simpson Aerospace Services. Simpson Alloy Services specializes in a wide variety of high temperature and wear resistant alloy material used to complete custom projects. These heat-treat related services include onsite service, 3D modeling and drafting, machine replacement parts, retrofitted equipment, as well as furnace and fan maintenance. Simpson Alloy's sister company, Simpson Aerospace Services, provides aerospace maintenance and ground support equipment for commercial airlines and military outfits who maintain and service both large and small aircrafts. 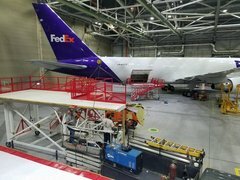 "It's a niche industry most people don't even think of," says General Manager Coy Stepro, "But aircraft and airframe maintenance, repair and operations is a huge industry with steadily growing needs." According to a recently released report on global trends, U.S. commercial aircraft fleets alone are expected to grow almost 3.5% over the next 2 years. In response to this increase in demand, SAS-INC. continues to build quality equipment to fit the need and application of each individual client. The company's custom-made aircraft maintenance stands are engineered to precise specifications in order to save maintenance time and improve working conditions. A stand can be a giant structure with multiple platforms that may go as high as several stories, or it can be a modest rolling stand giving a mechanic safe access to the many service locations of a narrow body jet. Given the industry's highly specialized nature, SAS-INC.s' new website offers more information about the company, it's people and products. "We're in a tech world, but we understand people still want to know who they're working with," Coy Stepro said. "We place a high value on relationships. The web allows us to create relationships, communicate and build those relationships across long distances. We can't be with them every day, but we can be connected through our technology." Nestled in the corn and soybean fields of Southern Indiana, SAS-INC. has completed installations as far away as Hawaii; offering technical expertise to clients far and wide looking for a safe and functional fit. Additionally, all parts are delivered on time and installed personally as part of the company's hands-on approach to workmanship. To learn more about SAS-INC., visit them online or contact them at 812-969-2766. SAS-INC. is based out of Elizabeth, Indiana and has been a family-owned business with the mission to "provide exceptional work for those who appreciate exceptional service" since its inception in 1992. Simpson Aerospace Services and Simpson Alloy Services, Inc. are both affiliated companies of SAS-INC. Originally rooted in agriculture and trucking services, other entities within the Simpson family of services include Simpson Farms, LLC and Simpson Agri Trucking, Inc.. For additional information about SAS-INC., call: 812-969-2766 or email: customerservice@simpson-services.com.